Wixie provides students with a digital canvas they can use to share ideas and communicate their understanding. You can give families a window into your classroom by sharing the amazing work their child is doing in Wixie at school. 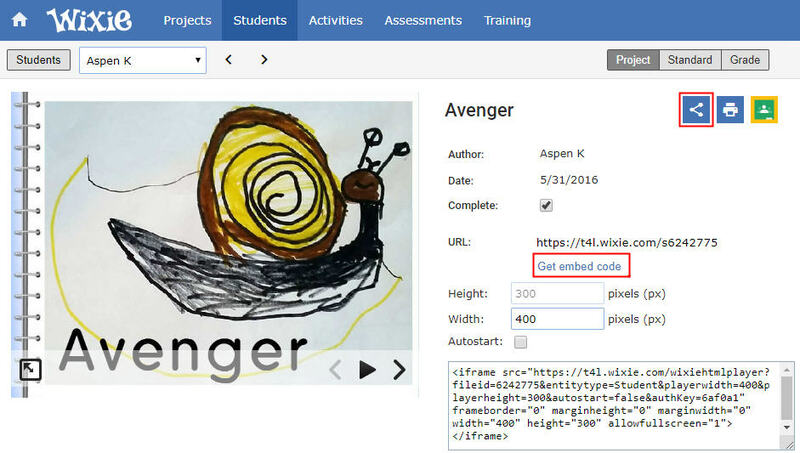 Wixie works online, which means you can embed student projects on your classroom or school website, email parents a direct link to a student project, and empower students with the knowledge and skills to log in when they are away from school. To share a student project, log in to your Wixie account. At the teacher dashboard, click the Students button and select the name of the student whose work you want to share. Click the specific project you want to share. If you want to share the project on your website, click the Get embed code link next to the project. This will show you the HTML code you need to embed the project on a web page. Simply select and copy the <iframe> code and then paste into the source code portion of the program you use to create your website. All Wixie work gets a unique web address, which you can see in the URL field next to the project. You can copy and paste this URL into a message in your email program or send the email directly from Wixie. Click the Share button located to the upper right of the project (see image above) to email a student's family or caregiver a link to the project and the necessary pass code. At the dialog that appears, enter the email address, or addresses, of the people you want to receive the project URL and pass code (public key) and type a note about the project. Click Send to send an email with the project URL and passcode (Public Key). 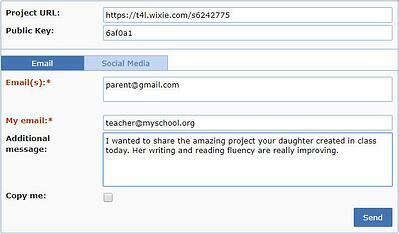 Parents can then simply click the link in their email to view their child's work, even from their cell phone. If families in your classroom access the Web on devices at home or at their local library, empower your students with the knowledge and skills to log in to Wixie from devices outside of school. Let parents know about the resources at the Parent Page for Wixie, such as Wixie guides that provide parents with ideas for students in grades K-5. The Training tab in Wixie even includes letters (in English, Spanish, and French) that you can send to parents to help them get their child logged in to Wixie when they aren't at school. No matter how you choose to share, Wixie can help you celebrate student learning and forge strong connections with families and caregivers. Use your student's enthusiasm for Wixie to infect their families with a love of learning too. PS - While they always like to see their child's work, parents especially love projects where they can hear their child's voice (view voice recording instructions) and see artwork unique to their child's interests and personality.